A Wonderful Wardrobe party is a unique and enchanting experience where your child and their friends will be transported on a magical journey of music and make-believe. 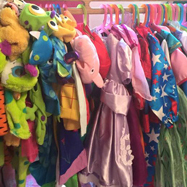 Young guests can take their pick of costumes from The Wonderful Wardrobe tree, and step into a world of superheroes and pirates, princesses and fairies, police officers, dragons or anything else they want to be. They will then take part in a magical story, featuring rhymes, action songs, music and singing, as well as props such as parachutes, balls and ribbons as they help depict the action. Parties are based on a successful tried-and-tested formula, but The Wonderful Wardrobe will work with your child to create a story unique to them, personalised with their favourite things. And it’s not just birthdays. You can also book The Wonderful Wardrobe for other events and celebrations involving children, such as family celebrations, weddings, Christenings, charity events and so on. All packages are tailor-made for the event in question so you can be sure of a party that best suits your event and guests. Choose from a one or two-hour party, suitable ages 1-6. 1.30pm – The Wonderful Wardrobe will arrive, set up and chat with the birthday child. 2pm – The Wonderful Wardrobe will help to greet your child’s guests and encourage them to choose from the various costumes. 2.15pm – Your personalised first party session. 3.15pm – Party food, birthday cake and Happy Birthday. 3.35pm – Your second personalised party session. 2.15pm – Your personalised one-hour party session. 3.15pm – Party food, birthday cake and Happy Birthday while The Wonderful Wardrobe packs up and leaves. 3.35pm – Party games or other activities organised by the hosts, or free play.